Examples of plant-derived pharmaceuticals that have become the focus of continuous and exponential research and development interest have, to date, been somewhat scarce. After a long period, the last two decades have been characterized by a 100-fold increase in the number of scientific articles published annually that are of relevance to the use of curcumin in biomedicine. Today, the already-wide spectrum of potential clinical applications of this natural drug and its synthetic derivatives continues to grow, including chemoprevention and the treatment of cancers, inflammatory and immune diseases, diabetes, bacterial and viral infections, parasitosis, and cardiovascular and neurodegenerative diseases. Over the last two decades, numerous findings have confirmed the safety of curcumin, both in preclinical and clinical studies. Its physicochemical properties, low bioavailability and rapid metabolism have, however, somewhat limited its potential therapeutic applications. To overcome these limitations, the last few years have seen an impressive development of research on analogs, prodrugs and nanostructured systems, a number of which are already demonstrating improved properties compared with the parent structure. In parallel, new administration routes have been explored, and additional pharmacological properties have been documented, leading in particular to promising prospects for pain management. This is the first book devoted to all of these aspects of research. It comprises 20 chapters (by 71 contributors) with 32 tables, 100 figures and about 2000 references, organized into three sections, with a progression from basic sciences to clinical applications. The first section relates to photophysical and photochemical properties, structure-activity relationships, the design of curcumin derivatives, its biological targets and pharmacology, prodrug concepts, and the development of nanoformulations of curcumin. 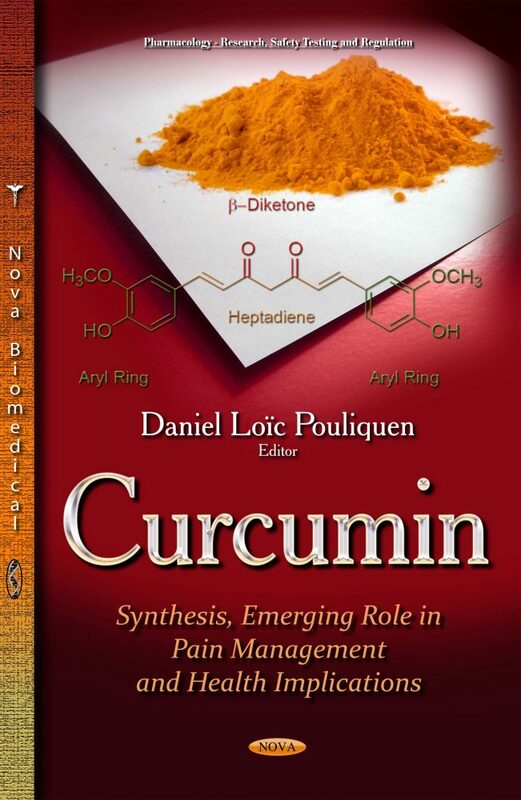 The second section covers the exploration of the antinociceptive role of curcumin and its clinical applications for pain management, treatment of neurological diseases and burn wounds, its anti-inflammatory and immunomodulatory properties, and its pharmacological effects for the treatment of parasitosis. The third section describes various aspects of the antitumor activities of curcumin and emerging therapeutic strategies using this drug and its many derivatives. Scientists, clinical researchers and physicians, students in biology and pharmacy.